On this first DVD programme we concentrate on the city centre and riding the trams. Filming starts at the Piazza Cordusio and Via Orefici to give you an introduction to the city, situated not far from the beautiful cathedral square known as the Piazza del Duomo. Further filming takes place around these streets before we board tram 1719 on route 1 to Piazza Cincinnato. Further tram rides are taken on tram 1677 on route 5 to the central railway station and back to Via Tunisia. A ride on tram 1754 on route 33 takes us to Stazione Garibaldi. After filming at Carlo Farini we board tram 4730 back to the city centre. Further rides are taken on tram 4612 to Santa Margherita and tram 1687 to Via Grossi. 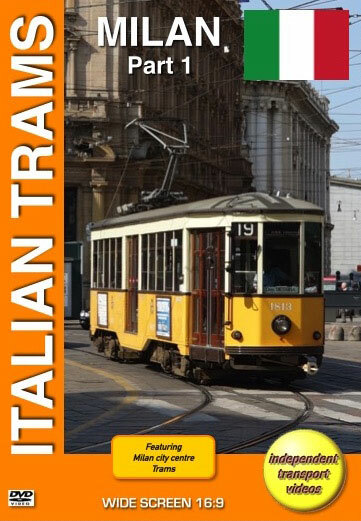 Piazza Castelli is the terminus of tram route 1 where our cameras take in some of the action before arriving at L.go Quinto Alpini for a ride on tram 4946, an unrebuilt Fiat Ferroviaria on route 27 back to the city. We complete our filming in and around the city streets as part one of this two-part programme draws to a close. All of the locations on this programme are subtitled to help you identify the locations should you wish to journey to Milan to take in the atmosphere of this wonderful city. Join us in Part 2 to sample the delights of the trolleybuses and some of the tram workings in the suburbs as well as more from the city centre.